Thank you so much for responding to my questions during such a busy time. Can you tell me a bit about the history of the conference? WB: The conference originally focused mainly on humanities disciplines; however, in the past few years the conference has expanded into an interdisciplinary event that encourages scholars across disciplines to converse and imagine ways that their project might evolve into collaborative work. With that said, it is also a great opportunity for students from similar disciplines to network and hear from other voices in the field. With this expansion towards interdisciplinary work, the conference has hosted poster sessions, panel discussions, documentaries, journal editor discussions, and this year we have added a creative reading session for creative writers to share some of their fiction, poetry, or creative non-fiction. How long have you been involved in the conference, and what role(s) do you perform? WB: This is my second year as the co-chair for the conference. I am working alongside Tingfang Lee (M.S. candidate in Computer Science and Statistics). This has been an opportunity for me to push myself outside of my comfort zone (reading and teaching) and I have gained several practical skills that I believe will be useful for a competitive job market. One of the most rewarding aspects of this experience has been collaborating with and thereby getting to know graduate students from other departments. Also, after we put together the conference last year, it was an amazing feeling to see something that we created come together. What is the theme of this year’s conference? 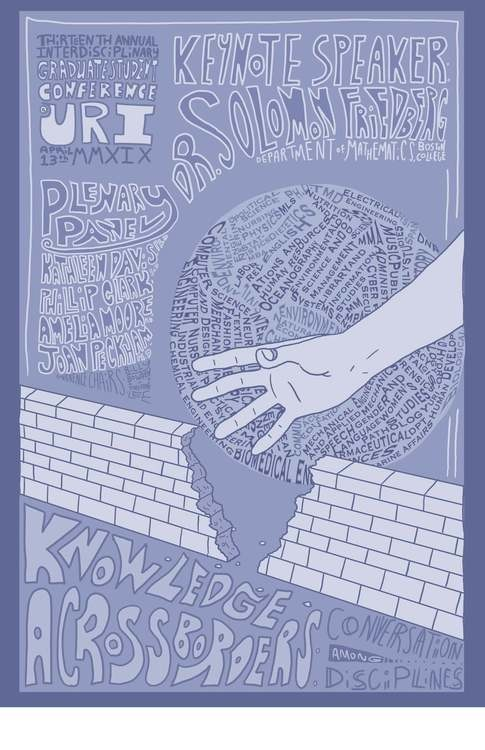 WB: The theme of the conference this year is “Knowledge Across Borders: Conversations Among Disciplines.” Voted for in a democratic discussion amongst a group of graduate student volunteers, our main priority this year was to create a theme that people wouldn’t shy away from because they weren’t sure if this conference would be a good ‘fit.’ After receiving submissions for this year’s conference, I think that I can say that this turned out to be a success. The theme is a timely topic both in academe and in society, and we hoped that this would establish an atmosphere where presenters and attendees would bridge the gap between the former and the latter. Who is this year’s keynote speaker? WB: Our keynote speaker for the conference this year is Dr. Solomon Friedberg the James P. Mcintyre Professor of Mathematics at Boston College. We see Dr. Friedberg as a scholar who has worked hard to bridge the gap between academia and society and therefore his presentation will be helpful for graduate students who aspire to produce similar work. In the late 1990s, Friedberg founded the Boston College Mathematics Case Studies Project to develop new training materials for use in TA-development programs for mathematics graduate students. He is presently Chair of the AMS-MAA Joint Committee on TAs and Part-Time Instructors. Friedberg has also been involved in precollegiate mathematics education since the 1990s, has written about math education in op-eds and blogs, and works with teachers in high-needs schools in the greater Boston area. He has been an editor of the CBMS book series Issues in Mathematics Education from 2006 on, serves on the National Academy of Science’s U.S National Commission on Mathematics Instruction, and is a member of the Board of Directors of Math for America Boston. In 2017-2018 he served as the lead math reviewer for a project to evaluate the nation’s standards organized by the Fordham Institute; their report, The State of State Standards Post-Common Core, was released August 22, 2018. Friedberg is also a dedicated teacher and was the winner of the Mathematical Association of America’s 2009 Northeastern Section Award for Distinguished College or University Teaching. Can graduate students still register for the conference? WB: Yes! You can still register if you would like to attend the conference by emailing us at urigradconference@etal.uri.edu. I should also mention that the conference includes breakfast, lunch and a reception in the afternoon. Heather J. Macpherson is assistant editor of the URI Graduate Blog and a PhD student in Literature focusing on Creative Nonfiction, the History of the Essay, and Animal Studies. She has work forthcoming in the Bennington Review, 580 Split, and Blueline.